It seems like the past year has flown past and in less than three weeks, we will be ushering in the Year of the Monkey! Seriously, where does all the time go to, I really wonder? It feels only awhile ago when we donned our matching family wear and went around visiting, feasting on new year goodies, giving out ang pows and having reunion meals. I don't know if I've mentioned it before but Chinese New Year is definitely one of my most-loved festivals. You can almost smell the sweet scent of spring and there is just so much bliss and hope in the air during this period. I love singing the catchy CNY songs, visiting Chinatown, watching the lion dance, meeting up with family and friends and just spreading joy to one another. Anyway, for this week's Creativity 521, we wanted to do something simple to get ourselves in the CNY mood! 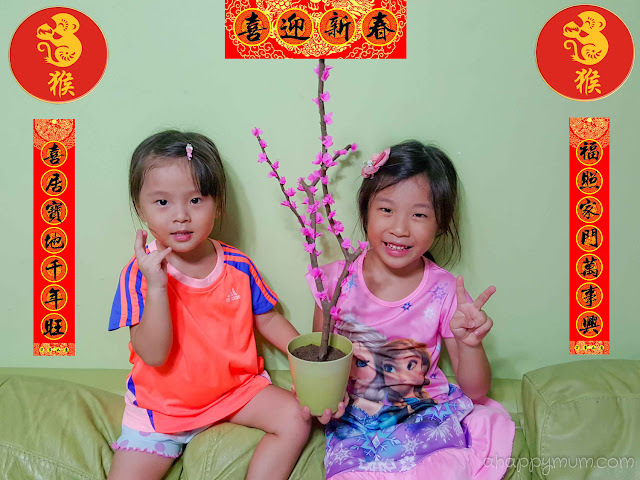 You know how the Chinese believes that there will be no fruits without flowers and thus likes to have flowers and plants as decorations during CNY to symbolise wealth and growth? We decided to make a DIY Cherry Blossom Branch which symbolises reliability and perseverance. Firstly, layer the crepe paper and cut out a flower shape (1"-1.5" in width) with five petals. Note that the flower does not have to be perfect or symmetrical in shape. Put two layers of the flower together, one on top of the other. Squeeze out some glue onto a piece of paper and using the end of a stick, dab a little of the glue and apply it in the middle. Holding down the middle part, fold up the petals and overlap them such that they make a flower shape as shown above. Once again, it doesn't have to be perfect and every flower can have its own unique look too! Give the base of the flower a squeeze and make sure it stays in place. Allow to dry. Repeat this as many times as you need. It's quite a good way to let the older kids cultivate their patience practise their fine motor skills! As for the younger one, she didn't really know how to fold the flowers so she helped with the applying of glue instead. We made a total of over 50 flowers! Pick a branch that has a nice structure and trim it if you need to. Apply glue on the base of the flowers and stick them one by one onto the branch, making sure that they are spaced out nicely. Continue until you have used up all your flowers or run out of space on the branch. Then, insert the branch into a flower pot and make it stay in place using a floral foam (or real soil if you have). Ta-dah! Easy peasy, we just made our very first DIY Cherry Blossom! I know, it's not as pretty as a real tree but then again, what was priceless was the fun of crafting and having a chance to bond with my kids. Are you feeling the CNY mood too? We sure are! Hi! Where did you buy the crepe paper from? Are there are other places that sell it besides Art Friend? Hihi, Popular has it and most stationery shops in the heartlands sell it too. :) comes in small packets in different colours.